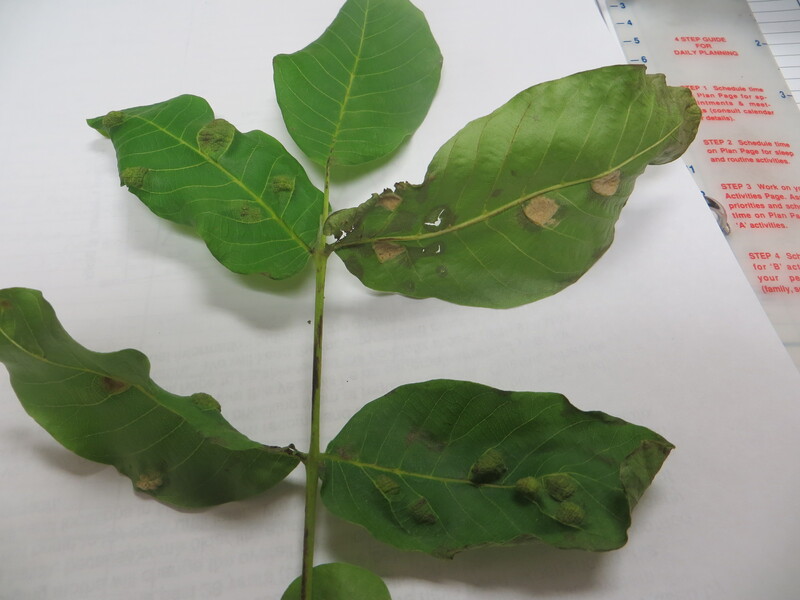 Damage caused by the walnut blister mite, Aceria erinea. The leaf in the upper right has been turned over to display the underside of the leaf blister. Pest description and damage The tiny body of the eriophyid mite is translucent and elongated, with numerous narrow rings; they have four legs at the head end. Different species are fairly host specific, but as a group they attack a wide array of plants. They attack stems, flowers, buds, leaves and needles, or they feed within needle sheaths. They look like little slivers and are best viewed with a 20x hand lens or scope. Damage varies with the host and includes leafy and woody galls of various shapes and sizes, stunting, erineum (felt-like patches), blisters, leaf curl, rusts, silvering, russeting of fruit, witch's brooms, twisting and chlorosis of needles, big buds on some hosts, stunting and deformities of seedlings and transmission of plant viruses. There are also several other less common eriophyid mites that damage plants. See specific hosts for more descriptive information. Despite these symptoms, mite numbers often drop substantially without human intervention. When mite populations are high, the plant creates an abscission layer and drops infested leaves. The mites perish as the leafy tissue dries out. Biology and life history These mites are unusual: they are cigar-shaped tapering to the hind end, with only four legs at the front end. The fertilized females overwinter and emerge as the buds expand in spring. There are only two nymphal instars, the second instar molts into an adult after a brief resting period. The eriophyids reproduce almost continuously through the season. They can complete their life cycle in as little as ten days or every two to three weeks. Mites living on leaves, flowers and fruit must migrate back onto the plant before the plant parts are shed. At that time, they are more exposed and vulnerable to weather and natural enemies. The mites spend winter in permanent tissues on the plant such as needle sheaths, or cracks and crevices on bark or buds and other protected sites. Pest monitoring Start by looking for silver or bronzed leaves, galls, or other symptoms. Then examine the symptoms for signs of eriophyid mites. Because eriophyid mites are so small, it takes close examination to uncover them in needle sheaths, or beneath bud scales, among the erineum, or within galls. Sometimes mites can be dislodged by striking a branch over a dark paper. 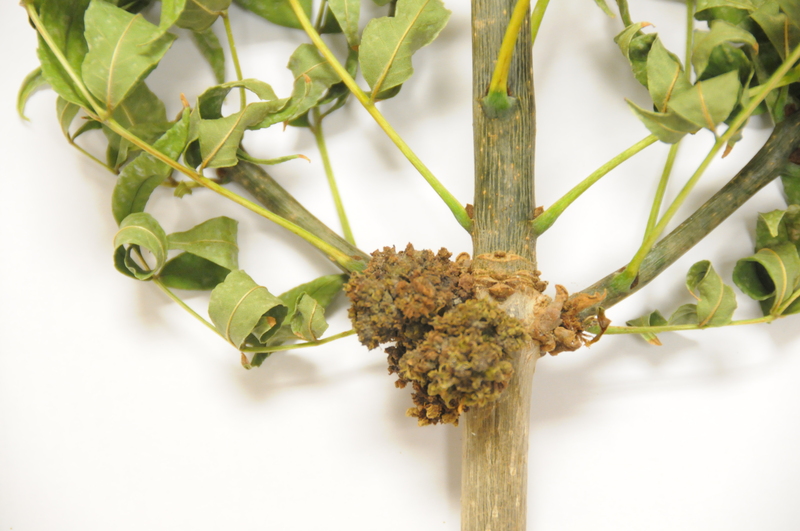 At other times, it takes perseverance and a good scope to finally locate mites in galls or affected plants. Wrap double-stick tape around twigs where mites are suspected, and where they can be easily inspected for trapped mites. When eriophyid mites move between sites (galls, buds, needles, etc.) they are more vulnerable to weather factors such as very high or low temperatures, wind, rain, irrigation, ultra violet, etc. Tolerate symptoms; generally, they are not a significant problem for the plant. Prune out the worst branches if it doesn't affect the shape of the plant. Pick off leaves when the symptoms are objectionable. During migration, the eriophyid mites are more exposed and vulnerable to natural controls such as predatory mites, mite destroyer ladybugs, cecidomyids, and other predators. Avoid using pesticides that kill predatory mites and other natural enemies. Tolerance: eriophyid mite populations often collapse on their own due to natural enemies and possibly plant defense mechanisms (extra hairs on leaves or buds, thicker plant cell walls, or plant chemicals).